In March 2012 Ofsted published the document Moving English Forward. This document was designed to tackle the problem of low and falling literacy levels in the UK and, for the first time, it mentions the need for a specific Reading For Enjoyment/Pleasure policy (see Moving English Forward, paras 65 – 71, pages 29-31) and we have seen evidence of these expectations on many Ofsted inspection reports since then. Mention of the presence of such a policy, or the lack of one, has been featuring on the front page of many returned reports since November 2012 when the new inspection framework was implemented. To help school librarians engage with the process of implementing this policy in their schools, CILIP SLG ran a course dealing with both the document Moving English Forward, and policy preparation. Barbara Ferramosca lead a workshop on writing a Reading for Pleasure policy on this day and it proved most informative and useful. My guest post today is written by Barbara, school librarian at Lilian Baylis Technology School in London – a school that was rated by Ofsted as “an outstanding school in all aspects” after their inspection under the new framework early in 2013. If you have any questions about this post, please comment and they will be forwarded to Barbara. Every school must provide a School Reading for Pleasure Policy during an Ofsted inspection: it is a simple fact that has huge consequences for our profession and a huge potential that we cannot afford to miss. Promoting a reading for enjoyment ethos is our field of expertise and it would not surprise me if a member of your School Leadership Team had already frantically accosted you with the question: “What are we doing to promote reading for pleasure in this school?”. If they have not, you must take the initiative and write the policy: if you present it to them, they will probably be just grateful that it is something they do not need to think about anymore, a box ticked in their inspection checklist! During our workshop, discussions lead to some very important points to consider in preparation for an inspection. The policy is a public document, an official school policy and it is at the heart of what you do: it explains your library commitment and beliefs in nurturing a genuine lifelong interest in reading in all your students. It does it by clearly acknowledging the widest possible definition of the term “reading for pleasure” and by involving different stakeholders that will give weight to the document. If it is a document whose principles are agreed upon by students, governors, members of staff and parents, it will become an important reference document for your service. It always sounds a daunting task to write a policy, especially if you have never written one before and it could become quite challenging and time-consuming to try to get all of these stakeholders involved. However, if time is of the essence, make sure to involve at least your students as a matter of priority. There is the possibility that Ofsted inspectors will not come and visit the library or speak to you . Your reading for pleasure policy is but a way to show what the library is doing because there is another more powerful voice that you can use to make sure that your message comes across loud and clear to them. Inspectors will speak to your students in several occasions and you must make sure that they will speak highly of the library and the impact that has on their attitude towards reading. Let them be your ambassadors. As a result of this, our advice was not to fret and spend a lot of time trying to put together a complicated and long policy but keep it simple, short and to the point. What should a reading for pleasure policy include? a clear outline of the difference between the Reading for Pleasure policy and the school literacy policy: this is absolutely necessary and we cannot underestimate the importance of reiterating this difference, especially with the Leader Management Team of our school. Literacy is a direct effect of Reading for enjoyment and we must ensure that we make clear the difference between the two in the clearest terms possible. a statement about the importance of using the widest definition of reading throughout the school. 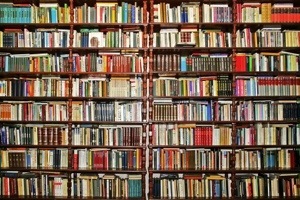 This could include newspapers, e-books, comics, etc. this is the point in your policy where you decide on your school’s definition of reading for pleasure. Ideally you want to use the widest definition possible and have it officially accepted in order to challenge any possible decisions that are made in the future that threaten our students’ right to choose what they want to read. access and equalities issues in relation to reading for pleasure. This should include accessible formats as well as consideration of the content of the books made available for use by the children: your policy must clearly state a commitment of the library to provide different books and resources in different formats in order to meet the needs of your students (i.e audiobooks, dyslexia-friendly publications, ebooks, books in other languages, etc.). Firstly, there must be an official acknowledgement that students may prefer to access stories in formats other than the printing. This is also particularly important in terms of the financial impact of such a statement simply because books in different formats cost more than simple paperbacks! the importance of the role of the teacher and other adults in school in relation to fostering a love of reading through a wide range of activities: this is the point in your policy when you acknowledge the importance of using role models in the school to support your message and that every single member of staff is responsible for reinforcing a positive attitude towards reading for enjoyment. This is what the inspectors will look for and now is probably a good time to get your Headteacher on board with this idea! links to planning for reading for pleasure across the curriculum for both the whole school and individual classes: after writing all the above, make sure to mention, maybe a series of bullet points, what the library is doing in order to give some concrete examples. As mentioned before, you can decide whether you want to write all the initiatives that you manage in detail. Discussions during the workshop lean towards writing brief descriptions rathen than complex and detailed ones. information about the practical ways in which home-school links can support the school policy: links with parents and how to empower them them to support their children is on the checklist of every inspection and we cannot miss to mention how the library contribute to this. Even if you just attend parents’ evenings or academic review days with a library stand and give posters out, include this in your policy! a commitment by the school to ensuring that all pupils have regular access to the school library, properly staffed, including the consideration of free access at break, lunchtimes and before/after school: this may sound redundant however in many occasions we have heard of colleagues’ experiences where the library was used as classroom or as an occasional venue for school events that are not led by the librarian. It is important not leave out a clear commitment from your school part to ensure that students have the opportunity to visit your library on their own free will to browse or borrow a book. a statement on the budget share for reading and library resources – it should be adequately funded on an annual basis, in line with other school budget areas: budget, budget, budget… in a quick show of hands exercise, it was pretty clear that the majority of the librarians attending our course felt that the library was underfunded. After a number of considerations, we felt that we had two big weapons in our arsenal to change this situation: firstly, your school’s FEAR of Ofsted. Secondly, the fact that reading is appearing more and more often in the FIRST page of many Ofsted school reports. We must turn this fear to our advantage by asking our school Leadership Management Team these simple questions: “How confident are you that students are happy with the resources available in the library? How confident are you that they will answer positively and enthusiastically about their attitudes towards reading and the initiatives led by the school? How confident are you that ALL students are aware of the importance of reading for pleasure to their future?” Now is the time to push the point that a library which is understaffed and underfunded will never achieve these goals. To make your point even more effective, do not hesitate to mention other schools’ reports where reading is mentioned: Adam Lancaster showed us a number of examples of reports of other schools in his area so his advice for us was to find these reports and use them! implications for professional development and support: is the school ready to give you opportunity to lead staff insets regarding the latest children literature or on how to promote reading for pleasure in the classroom? Is the school ready to acknowledge that you need time to attend professional courses? a commitment to evaluate the Reading for Pleasure policy. A reading for Pleasure policy should be reviewed ideally once every year. Hairrell, A., Edmonds, M., Vaughn, S., & Simmons, D. (2010). Independent Silent Reading for Struggling Readers: Pitfalls and Potential. In E. H. Hiebert, & D. Reutzel (Eds. ), Revisiting Silent Reading (pp. 275-289). Newark, DE: International Reading Association. 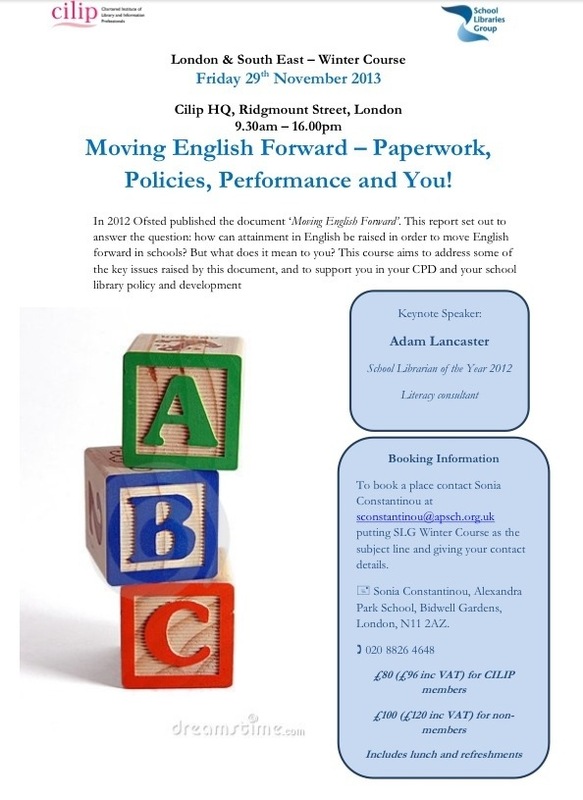 In 2012 Ofsted published the document ‘Moving English Forward’. This report set out to answer the question: how can attainment in English be raised in order to move English forward in schools? But what does it mean to you? This course aims to address some of the key issues raised by this document, and to support you in your CPD and your school library policy documents and development. The day will consist of a morning talk and presentation from our speaker (Adam Lancaster) followed by an afternoon of workshops and development activities. To book a place contact sconstantinou@apsch.org.uk putting SLG Winter Course as the subject line and giving your contact details. The cost of the booking includes lunch and refreshments. The training will begin at 9.30am and end at 4pm.